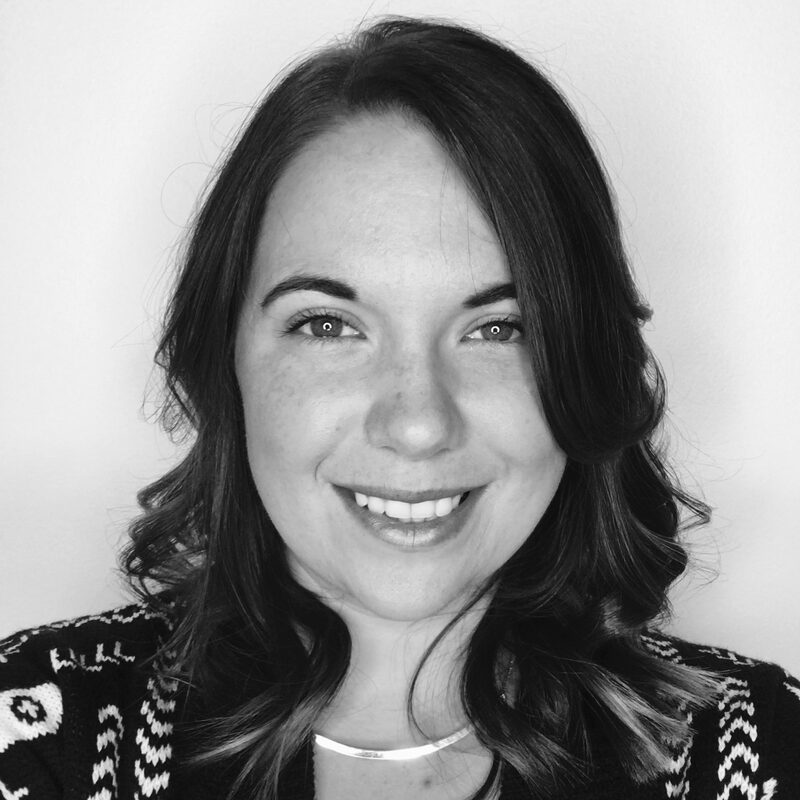 HR Generalist Molly Brady is the mastermind behind POP’s highly customized (and fun!) onboarding process. When POP began crafting an onboarding process for new hires, they quickly realized that a one-size-fits-all method wasn’t going to cut it. Why? 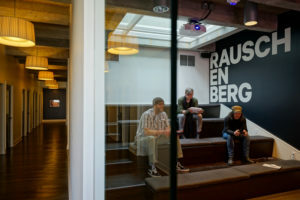 As a digital marketing agency with over 100 employees—a solid mix of both contractors and full-time hires—their approach to onboarding required that they take a unique and creative perspective. HR Generalist Molly Brady intuited that while some aspects of the onboarding process were vital for all new hires (like instructions for submitting a timesheet or introductions to key stakeholders), there were still many parts of the process that needed to be customized to fit an employee’s particular role and type of employment within the company. So how is POP optimizing contractors’ experience and making sure they feel ready to contribute to the team in a condensed amount of time? Since they often have only 24 hours to ramp up a new contractor, task-based reminders move the process forward quickly. These changes have alleviated several hours a week of manual checklists and countless back-and-forth emails. 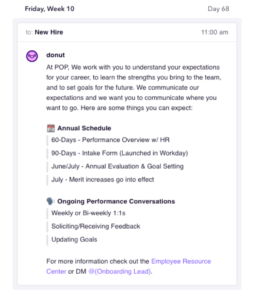 Identifying and isolating which information should be considered “essential” for employees was just one piece of the puzzle in designing a great onboarding experience. How can you keep employees engaged and communicate the most pertinent information at exactly the right time? One of the ways Molly accomplished this was by centering POP’s onboarding process around the things that create lasting impact and are unique to their company culture. 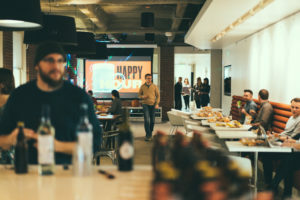 Structuring the onboarding experience around employee happiness has allowed POP to open up a whole new layer of culture-building. In addition to stemming the fire hose of information that new hires typically receive with just-in-time prompts and reducing redundant emails to managers, Molly uses Donut to collect feedback from employees and managers about how new hires are adjusting during their first 90 days. That’s given her the bandwidth and knowledge to strategically create some fun and useful content aimed at helping new hires feel at-home faster. Think: nearby food trucks, a map of the office (because who doesn’t hate getting lost their first week! ), and upcoming relevant training opportunities. In this way, employees are made to feel welcomed and valued, they receive the information they need in a timely manner, and they are encouraged to think about their long-term career growth—changes that have caught the SVP of Operations’ eye. Her solve for thinking about long-term employee development? 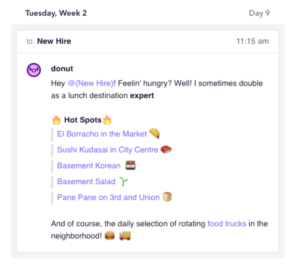 A notification around the two-month mark in Donut that reminds employees about their upcoming performance review with a breakdown of the schedule, as well as a link to relevant internal content. The goal is to demonstrate POP’s investment in the new hire and help them see the path forward. Plus, it gives employees an opportunity to start thinking about important topics ahead of time. Make a great first impression with Donut!